With the MS International Champagne Toast Interlocking 12 in. x 12 in. 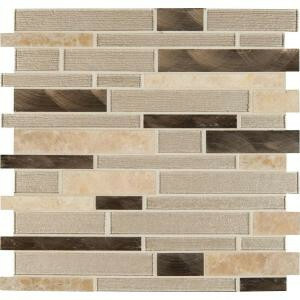 Glass/Metal/Stone Blend Mosaic Wall Tile, it's easy to add a splash of contemporary styling to your decor. This attractive tile features a seemingly random arrangement of crystallized glass, brushed metal and natural marble tile strips on a mesh sheet that makes installation a much easier process. With striking warm-toned Champagne Toast blends glass, brushed metal and marble, this tile creates a distinct pattern. Ideal for use on interior and exterior walls, the mosaic has infinite applications to complement a variety of installs. 20 square feet, 20 pieces per case. Case weight is 30 lb. Buy online MS International Champagne Toast Interlocking 12 in. x 12 in. x 4 mm Glass Metal Stone Mesh-Mounted Mosaic Tile (20 sq. ft. / case) SGLSMTIL-CHATST, leave review and share Your friends.